Sheffield City Council has taken delivery of five Renault Kangoo Z.E. 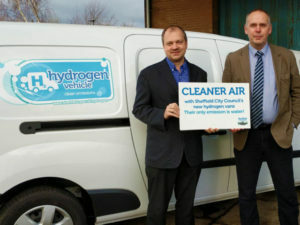 electric vans converted to run on hydrogen. Supplied by Arcola Energy, the vehicles are based on the standard electric vans but feature a 5Kw Hydrogen Fuel Cell built into the load area providing additional energy to the batteries, therefore doubling the range and the working time of the vehicle. The vehicle batteries are being charged overnight as with standard electric vehicles while the hydrogen is supplied by the local ITM Power fuel station, produced through electrolysis using wind generated renewable energy. The vehicles have already been put into use across the city, working in areas such as parking services. The move follows the publication of the council’s clean air strategy plans, which have now been endorsed by the cabinet and will go out to consultation early next year.